Lechón being roasted in Cadiz, Negros Occidental, Philippines. In most regions of the Philippines, lechón (also spelled litson or lichon) is prepared throughout the year for special occasions, festivals, and the holidays. There are two major types of preparing lechon the Philippines, the "Manila lechon" (or "Luzon lechon"), and the "Cebu lechon" (or "Visayas lechon"). Visayan lechon is prepared stuffed with herbs which usually include scallions, bay leaves, black peppercorn, garlic, salt, and distinctively tanglad (lemongrass) and/or leaves from native Citrus trees, among other spices. A variant among Hiligaynon people also stuffs the pig with batuan or binukaw (Garcinia binucao). It is usually cooked over charcoal made from coconut husks. Since it is already flavored with spices, it is served with minimal dipping sauces, like salt and vinegar or silimansi (soy sauce, calamansi, and labuyo chili). Luzon lechon on the other hand, is typically not stuffed with herbs. When it is, it is usually just salt and pepper. Instead, the distinctiveness of Manila lechon comes from the liver-based sauce, known as the "lechon sauce". 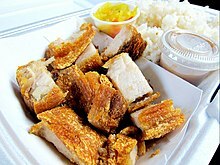 Lechon sauce is made from vinegar, brown sugar, salt, pepper, mashed liver (or liver spread), breadcrumbs, garlic and onion. 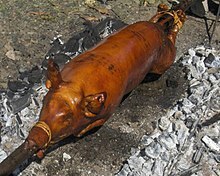 Manila lechon is also typically cooked over woodfire. Most lechon can either be cooked based on the two main versions, or mix techniques from both. Both variants also rub salt or spices unto the skin to make it crispier, as well as continually baste the lechon as it cooks. Sometimes carbonated drinks may also be used. They are cooked on a bamboo spit over charcoal for a few hours with constant (traditionally manual) turning. The pig is roasted on all sides for several hours until done. The process of cooking and basting usually results in making the pork skin crisp and is a distinctive feature of the dish. ^ Jonathan Deutsch; Megan J. Elias (15 April 2014). Barbecue: A Global History. Reaktion Books. p. 90. ISBN 978-1-78023-298-0. ^ Vicky B. Bartlet (17 December 2011). "Palmonas: Make 'buko' juice as national drink". Business Mirror. Archived from the original on 10 January 2012. Retrieved 26 January 2012. In his House Resolution 1887, Agham (Science) Party-list Rep. Angelo Palmones said the Philippines has already a number of national symbols, such as narra as national tree, sampaguita as national flower, mango as national fruit, milkfish as national fish and lechon (roast pig) as national dish. ^ Cohen, Tina; Bernthal, Ron (2006). Puerto Rico Off the Beaten Path, 5th: Volume 5 of OFF THE BEATEN PATH PUERTO RICO. Globe Pequot Press. p. xi. ISBN 978-0-7627-4211-0. Retrieved 26 January 2012. Lechon asado (roasted suckling pig) is the national dish of Puerto Rico and is festively presented at holidays and family occasions. ^ a b c Faicol, Bea. "What's the Difference Between Luzon Lechon and Visayas Lechon?". Eat + Drink. Spot.ph. Retrieved 25 January 2019. ^ a b c Manahan, Millie (13 July 2017). "Manila or Cebu Lechon: A Staple Filipino Food for all Occasions". When In Manila. Retrieved 25 January 2019. ^ "Nothing quite like Negros Lechon – Bacolod". Now We Are Hungry. Retrieved 3 February 2019. ^ Chan, Bernice. "The secrets to great lechon - whole roasted suckling pig that's virtually a Filipino national dish". South China Morning Post. Retrieved 25 January 2019. ^ "Lechon Sauce". Kawaling Pinoy. Retrieved 25 January 2019. ^ Reynaldo G. Alejandro (8 December 2015). Food of the Philippines. Tuttle Publishing. p. 10. ISBN 978-1-4629-0545-4. Customs and Culture of the Philippines. Tuttle Publishing. 15 June 1963. pp. 112–113. ISBN 978-1-4629-1302-2. ^ "The Lechon In Our Culture". EditorialToday A Guide to Business. ^ "Lechon Paksiw (Bisaya Style)". Chedz Culinary Club. Retrieved 25 January 2019. Wikimedia Commons has media related to Lechon.